John Brennan (Russell Crowe) and his wife Lara (Elizabeth Banks) have a pretty good life. Good jobs, a six year old son Luke (Sympkins) they both adore, healthy parents and a Toyota Prius, domestic suburban bliss. That is until Lara gets inconveniently and very quickly, convicted of murder and slammed up in a Pittsburgh prison for life. The film plays fast and loose with timelines, moving backwards and forwards to the present, which takes a moment or two to grasp but does work very effectively. The jaundiced Police and Prison guards are all believable but the film is centered on Crowe’s performance. As usual, he does not disappoint, he is one of the few “A List” actors able to move believably from playing a 19th Century sea captain (Master and Commander), Robin Hood, Roman Gladiator and here, ordinary man community lecturer. Lara is in jail for murdering her female boss, her guilt apparently obvious from the circumstantial evidence on display, it is clear to everyone she is not getting out anytime soon. John is unable to accept his lawyers view and plans to spring his wife, run and keep running with his small family. None of this is a plot spoiler, as it made very plain both from trailers and early in the film. What is interesting, is the way John gradually slides into a world he does not understand or normally inhabit. The slippery slope that gets steeper and murkier the further you move from the fripperies, light and trinkets of ordinary life. A star makes a cameo appearance and nudges John towards the dark with fair warning, what is he prepared to do, how far will he go for what he wants. “Show me where the bullets go”, he asks when buying his first gun, he certainly gets to use them soon enough. Good to see Brian Dennehey in a small but pivotal role as John’s father, acknowledging the full cost of the actions he is considering with very little spoken dialogue. Director Paul Haggis has created a film that is exciting with some very neat touches to add to the ever present ticking clock effect. The dragnets that will be in place at fifteen and thirty five minutes are a good device to move the audience towards the edge of their seat, a place you will be familiar with towards the end of the film. The action sequences are brief but done well and the suspense is ratcheted up high, with you wanting to shout “just get back in the car and drive”, on a couple of occasions. Nit-picks, the escape plot does appear to rely on some very tight time assumptions and appears riddled with “what ifs” despite all the planning. Lara appears to fare very well in prison, looking just as bright and attractive as the day she was incarcerated, obviously prison life suited her. Look out for House’s “number thirteen” (Olivia Wilde), soon to be seen in “Cowboys and Aliens” as her star continues to rise. A cracking thriller with a great ending, that is better than some reports and box office returns might suggest. 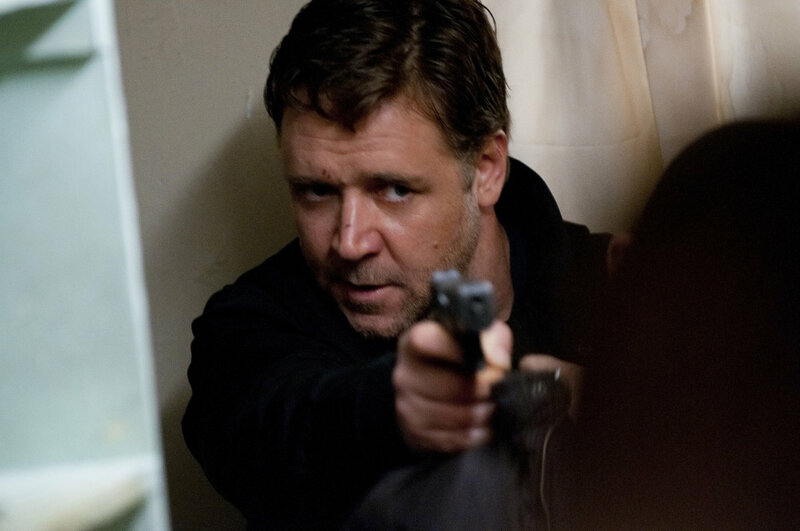 Crowe adds another creditable role to his diverse resume providing yet another example of his broad acting range.